I like the rounded and nicely-spaced design of 3DAndy's Pentominos on Thingiverse, but wanted to print some tetrominos instead, for math/puzzles (for example, polyomino packing problems) and for future Tetris-related art projects. Since 3DAndy was nice enough to post his OpenSCAD code, it was easy to modify his pentomino-T into a tetromino-T. Settings: MakerWare .3mm/low, with 8 T's printing in 45 minutes and weighing only 16 grams. 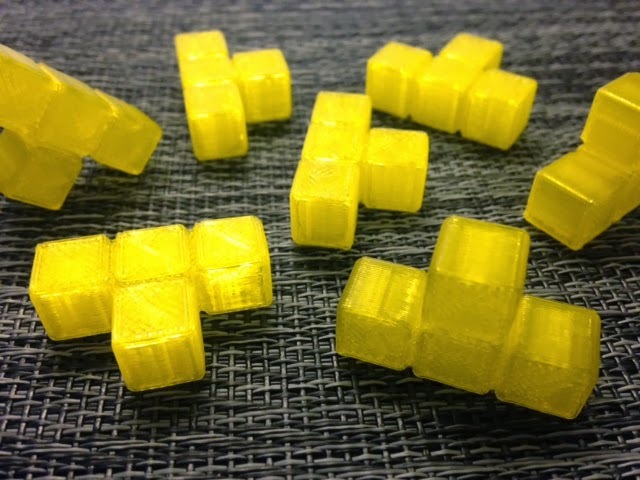 Tetris pieces is a great "stash-busting project" for those of you with lots of little scraps of filament that are too small for any normal print job. Technical notes: Download the OpenSCAD code here or cut and paste from the below. // mathgrrl tetrominos - example with Tetris "T"
//render an instance of the Tetris "T"
//define the blocks and connectors that make the Tetris "T"